Building a great place to play in Brooklyn | KaBOOM! 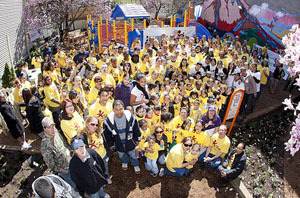 On April 21st, 2011 KaBOOM!, Nuestros Ninos CD School and Dr Pepper Snapple Group built a great new place to play in Brooklyn. Now, the kids are more tired and getting tons of exercise running around, on and under their new playground. For the first time they have a hard time getting the kids to go inside. Play it forward with a donation today, because kids need play to stay healthy.